Hensel Phelps is honored to announce that the company is among 15 recipients of the 2017 Secretary of Defense Employer Support Freedom Award. This award publicly recognizes employers who provide exceptional support to their Guard and Reserve employees and is the highest in a series of employer recognition awards given by the Department of Defense. Recipients were selected from 3,064 nominations made this year by a Guard or Reserve member employed by the organization they nominated (or by a family member acting on their behalf). Hensel Phelps was nominated by Second Lieutenant Kyle Dougherty of the Army Reserve, a field engineer in Hensel Phelps’ Mid Atlantic District. 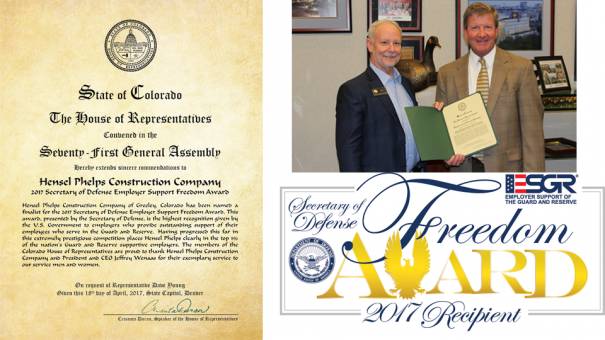 Previously, the Colorado House of Representatives commended Hensel Phelps on being named a finalist for the 2017 Freedom Award. Rep. Dave Young, D-Greeley, delivered the certificate in person to president and CEO Jeff Wenaas at Hensel Phelps’ corporate office on May 26. Hensel Phelps, along with the other 2017 Freedom Award recipients, will be recognized at a ceremony at the Pentagon on August 25, 2017. To learn more about the Freedom Award and the 2017 recipients, visit: http://www.freedomaward.mil/media/press-releases/itemid/770/2017-freedom-award-recipients-announced.